CakeSpy Note: You know what rules? Getting bakery tips from readers. Here's a great round-up of sweet spots that I know I'll be trying next time I'm in Montreal, thanks to Cake Gumshoe Lauren H.! Given Montreal’s ties to France, it seems logical to assume that the city is full of lovely French bakeries; so my husband and I spent a recent trip testing this hypothesis by visiting as many Montreal bakeries as possible! Thankfully, the assumption is correct – lots of good bakeries – and I wanted to share our findings with fellow Cakespy readers, in hopes of providing a couple of places for them to try next time they’re in Montreal! As we visited a lot of places, I’ve ranked them in our order of preference. I’ve included boulangeries and patisseries on the walk, because you sometimes need some good bread to cut the sweet of all of the patisserie visits! 1. Duc de Lorraine. The pastries from Duc de Lorraine were far and away our favorites of the trip. While we took our treats to go, the bakery did have seating and savory options. In researching places to try, I’d read excellent things about the bakery, and it was clear why! The pastries that we tried (pictured below, clockwise from upper left, coffee éclair, delicious strawberry/banana pastry, crème éclair, and chocolate éclair) were as good as any that we had in Paris, and I’d return in a heartbeat! 2. Patisserie Kouign Amman. I had seen Kouign Amman on the Cakespy site and was hoping to try to visit, so I was thrilled when we passed it during a visit to Mont Royal. Unfortunately, we popped in late in the day, and there were no more pastries to try. 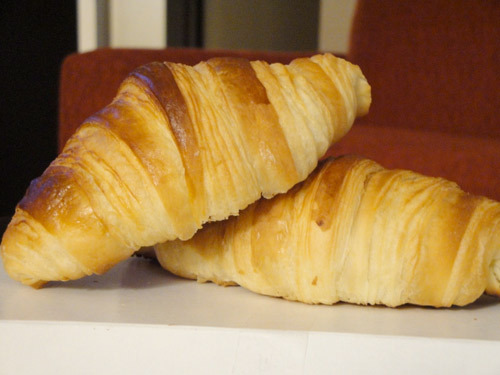 Fortunately, they were still well-stocked with croissants, so we picked up a few for later. Thankfully, my husband talked me out of my original attempt at restraint (“Let’s just get one to share”), because I don’t think either of us would have been willing to give up a bite after tasting how wonderful the Kouign Amman croissants were. They’re everything that you’d want a croissant to be – flaky, buttery, and delicious. 3. Le Fromentier. 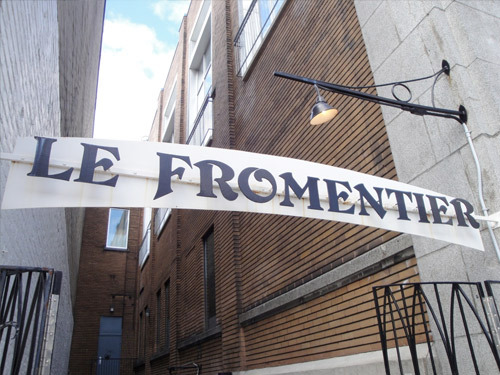 I went to Le Fromentier specifically to get bread for a picnic dinner, and it was absolutely worth the trip. The shop itself is delightful and very European (one of the only places in Montreal where the shop keeper spoke only French), with breads, cheeses, and pastries. We only tried the bread, which was wonderful (especially the sourdough baguette), but I’d imagine that the pastries are equally wonderful. Le Fromentier is a bit out of the way and a bit of a walk from the closest metro station, but it’s definitely worth the hike! 4. Olive + Gourmando. I’d read that Olive + Gourmando was slightly more a brunch café, and that does appear to be the case, at least in part. We visited late on a Saturday morning, and they had soups, sandwiches, and hot breakfasts available in addition to more traditional baked goods and coffee. It was incredibly crowded, but the staff was efficient and got us a table in about ten minutes (impressive, given that there were 3 – 4 couples in front of us in line). They also offer the option of ordering your coffee and pastry to go, which numerous people appeared to be doing. We stayed more on the savory side at Olive + Gourmando, trying toast with cheddar, an apple and cinnamon “brioche” (more of a cinnamon roll), and a croissant au fromage (pictured, left to right, below). 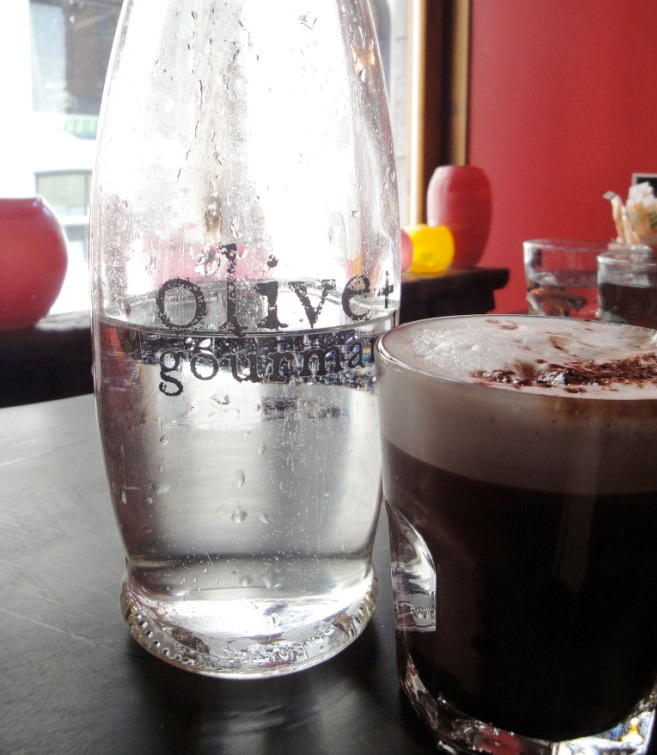 All three (and the coffee and hot chocolate) were lovely; this fact, combined with Olive + Gourmando’s central Old Montreal location, makes it a great place to try! 5. Café Myriade. Technically, Café Myriade is a coffee shop. Still, I’m including it on the list because their cinnamon bun (pictured above) was one of the best non-patisserie treats that I had during the trip and my husband ranked his croissant (pictured below) as very close to those of Kouign Amann in quality. In short, Café Myriade has wonderful coffee and pastries and a very cozy ambiance – definitely worth a visit! 6. Premiere Moisson. Premiere Moisson is one of Montreal’s chain bakeries; they have approximately twenty locations throughout the city. However, the “chain” label is perhaps deceptive in this case: we visited the location close to our hotel a few times, trying more than the crème éclair and opera cake pictured above, and found all of the pastries to be very nice and not at all what you might expect from a place with so many locations. While Premiere Moisson lacks the “neighborhood” feel that the places ranked above it possess, its treats are good, and its multiple locations make it a great place to grab a nice pastry while you’re running around Montreal! 7. Claude Postel. 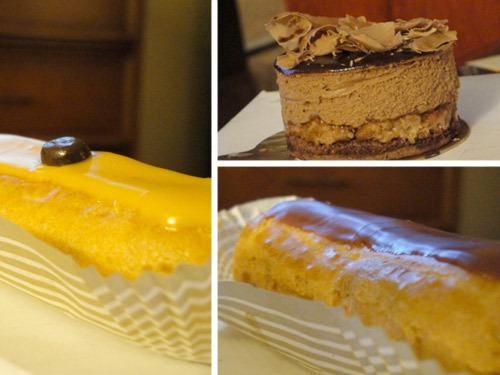 We stumbled across Claude Postel in Old Montreal and decided to pick up our desserts for the evening (coffee éclair, chocolate dessert whose proper name escapes me, and chocolate éclair, pictured left to right below) there. I’d definitely recommend it – everything was good – but the pastries didn’t quite measure up to the pastries from the other locations that we tried. 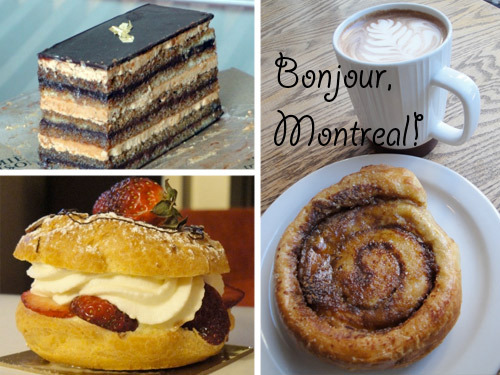 Still, I’d try everything that we had there again – one of the benefits of Montreal is clearly that even the 7th ranked bakery on the list is still pretty wonderful! 8. Cocoa Locale. Cocoa Locale is ranked 8th only because it was closed when we arrived to give it a go. However, it is worth noting that it was closed an hour before it was scheduled to be because it had completely sold out of its cakes and pastries for the day (as the sign in the above photo indicates). This fact makes me think it would be ranked much higher if we’d actually gotten to try a Cocoa Locale cake – and puts it on the top of my list for our next trip to Montreal! 9. Boutique Point G. Ranked last, behind even the place we were unable to visit, is Point G. We were drawn in by all of the brightly colored macarons and couldn’t resist trying a few, but it was such a disappointment! As my husband put it, “These look like Paris macarons, but they most certainly don’t taste like them!” The cookies were very cake-y and paled in comparison to all of the other treats that we tried during our trip; in fact, we carried the majority of them home and actually never ate them. Point G is a few blocks away from Kouign Amman – I’d definitely recommend skipping the macarons and going for a croissant instead! I hope this walk gets other Cakespy readers visiting Montreal started on a boulangerie- and patisserie-filled trip!